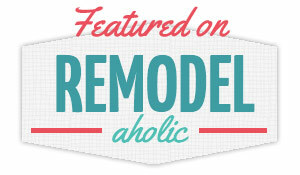 I've been thinking about Mother's Day gifts and was perusing the selection at Magnolia Market, the online retail outpost of our favorite HGTV renovation couple, Joanna and Chip Gaines from "Fixer Upper." Joanna has a signature magnolia wreath that she uses in almost all of her renovations, and she sells it in their store. Unfortunately, that $95 price tag is not in my budget. 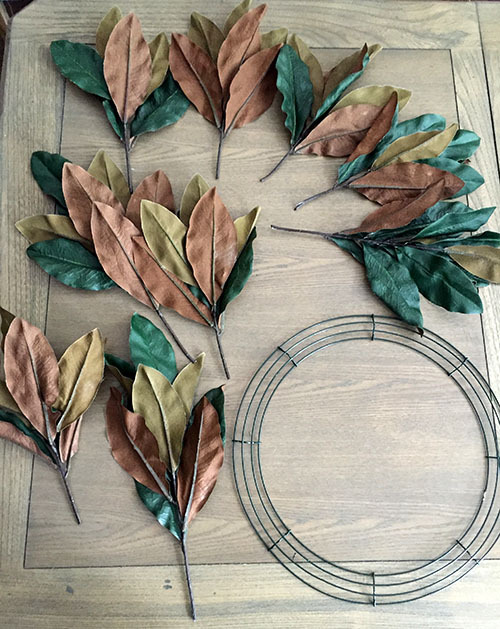 So when I received an email from Hobby Lobby telling me that all floral items were 50% off - and the sample photo was a $2.50 branch of magnolia leaves - I made up my mind to try to make my own wreath for less. The twins and I made the outing to Hobby Lobby and bought all of their magnolia branches (they only had 3 left) and a wire wreath form. I didn't buy anything else because I knew I already had wire to attach the branches at home, and I thought that would be all I needed. My total purchase price with the 50% off discount was just under $12. This project was really simple and only took me about 30 minutes to complete. When the twins were napping, I got to work. I'm turning into one of those people who does everything as fast as possible during naps because I know one of them could wake up crying at any minute. I used to be such a slow eater but now I'm scarfing down my meals like my life depends on it! That's just one of many changes I've noticed about myself since I became a mother. My first step was to cut off all of the leaf bunches from the long stems. 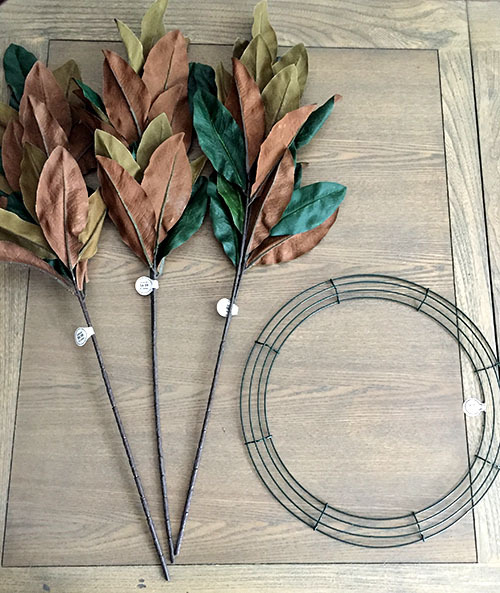 Then I simply fluffed up each bunch of leaves and attached them to the wreath form using some extra wire we already had. 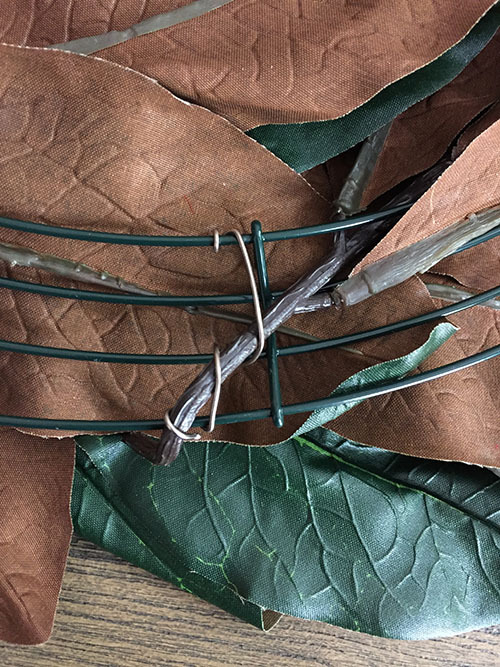 Floral wire or tape would be perfect for this part if you have those supplies instead. Pretty soon I had this nice looking wreath. Not bad, right? If I were trying to make it better, I would buy even more leaves to really fill it out. Too bad my Hobby Lobby ran out. I think it would work equally well with a foam wreath form, too, if you wanted to give that a shot. 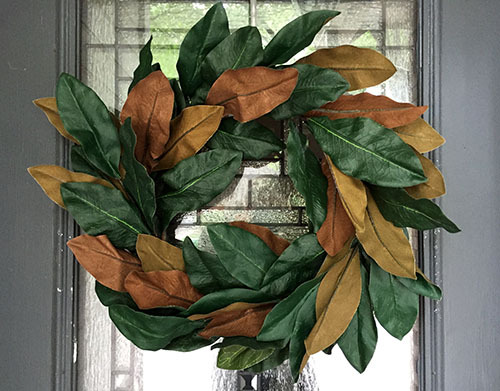 It may not be as nice (in terms of faux leaf quality) as the original Fixer Upper wreath, but it's certainly a passable knockoff for a much more appealing price tag.